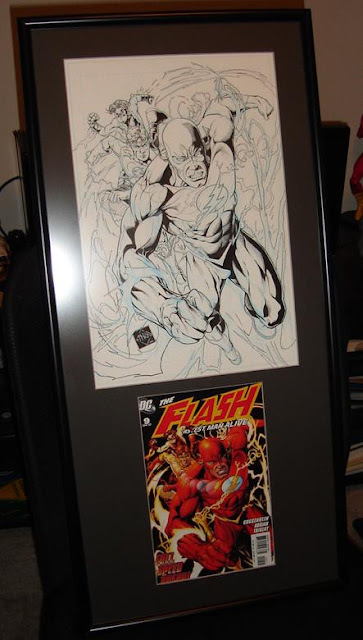 One of the highlights of my collection; the original art for the cover of Flash: Fastest Man Alive 9. The story behind this is pretty awesome. When it was announced that Ethan Van Scriver was going to be doing covers for the Flash I teased him that he would be returning to the Flash just when I was too broke to purchase anything. I was going to be getting married soon so I didn’t have the cash for things like art. My wife went behind my back and bought the art for me. As you can see it makes a fantastic present. I love this cover. Not just because I own it either. Ethan actually worked on the Impulse book, so he was a perfect artist to have Bart in all of his costumes. An interesting note, the background wasn’t supposed to be a dull flat color. It was actually supposed to be a red spiraling mass like a black hole or something. It looked much better then the background DC added. 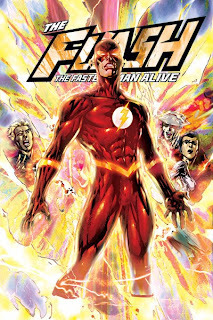 Bart is back to being Kid Flash, so even though he is no longer the Flash I still love this cover. Come back next week and I’ll share some more Impulsiveness that I just picked up. 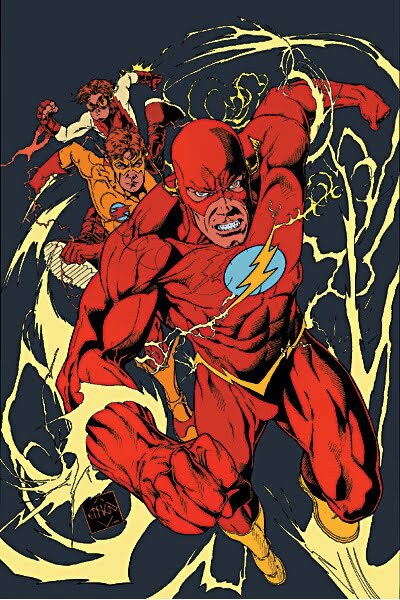 I love love LOVE EVS' style on the Impulse series, mostly because it was clearly toony - a theme that fit it well, and a theme I like in general - but I cannot say that his current realistic style appeals to me highly at the moment. I knew of EVS when on Impulse. I fell in love with his stuff on Iron Heights. At this point I can't view his art unbiasedly because his family has been incredible to me and mine.